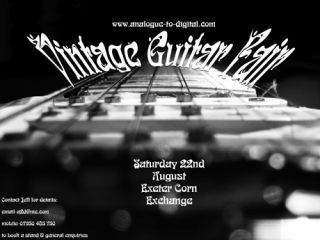 Analogue To Digital present Exeter's first ever Vintage Guitar Fair to be held on Saturday 22 August at the Exeter Corn Exchange. Originally inspired by MusicRadar's Classifieds forum, this event is for all musicians that love a used bargain. Many users wanted a way to try before they buy and meet up in the real world, sell to each other and trade their old equipment. This event is for all both private and trade, so stands are available for you to come sell your old music equipment, trade with each other, or just come and hunt for a bargain. The event will feature mainly vintage guitars and there will be vintage instruments from all over the UK for sale at this event. However, the event will also play host to all manner of used music equipment including guitar amps, pedals, vintage synths and recording equipment. So this gives you all enough time to go routing through your attics to clear some space and generate some cash - to spend on more instruments of course! For more details see www.analogue-to-digital.com. The site is being updated on a weekly basis all the way through the summer, so be sure to check regularly for breaking news.